Out of touch with reality. A term we use almost without thinking. It might describe our demented old-maid aunt or a person with whom we seriously disagree about politics, religion, or the like. One never thinks it applies to oneself. The realization that it does comes as a shock. # Although I have traveled extensively in Central Asia, Turkey, and other countries in the region over the past 15 years, I was nevertheless filled with some trepidation while planning a trip to Iran. My friends' reactions ranged from "you're crazy" to "you're totally crazy." 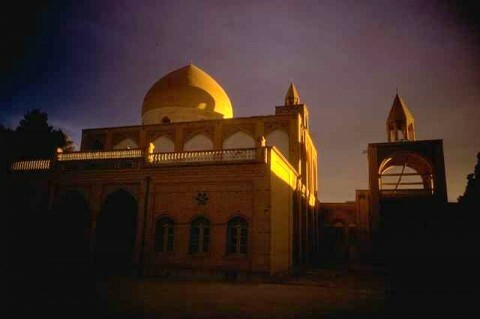 The obvious attraction of Iran is that it, along with Iraq, is the cradle of civilization. I wanted the chance to see those antiquities which may be lost forever if war erupts. That I was surprised by the people, the cities, the culture, the arts and artifacts and antiquities of Iran is an understatement. Tehran is a giant, smoggy city of seventeen million people. It contains one of the most astonishing anthropological museums in the world. There on display are art and artifacts from two to five thousand years B.C. The intricate design, decoration and painting of these relics (pottery, jewelry and utensils) is astonishing. I actually touched (while the guard was distracted) a small clay figurine of the Goddess of Fertility that dated from 6,000 B.C. The traffic in Tehran, and indeed throughout Iran, boggles the mind. It is almost like some kind of ballet, almost no horn-honking or fist-shaking (ala New York or Rome), but almost no traffic controls, cars weaving in and out, the ever-present small motorcycles and pedestrians, and the whole thing goes on as if choreographed. The people through Iran were equally surprising. They were unfailingly friendly, welcoming, and curious. I walked alone around parts of the various cities and villages that I visited and felt absolutely no apprehension. I was often approached by people of all ages wanting to know where I was from and trying to practice their English. Once they learned that I was from America, without exception, they burst into smiles and had lots of questions. I was repeatedly thanked by people for visiting their country and was given suggestions about things that I should not miss. Besides Tehran, I visited small villages and the major cities of Shiraz and Isfahan. I visited ancient ruins and ziggurats in the very small villages. I spent an afternoon at the 2,500-year-old ruins of Persopholis and other 5,000-year-old ruins from the Aryan times. I found these ancient sites to be uniformly inspiring and well maintained. There is no alcohol in Iran, so people meet in teahouses and sit around, smoke tobacco water-pipes, and gossip. Often there will be groups of young women, shrouded in black, some of whom are talking on cell phones or smoking cigarettes, although cigarette smoking is rare in Iran. It was in the tea houses that I was able to have conversations with young businessmen and guides who spoke English. Also, I saw almost no overweight people in Iran, probably due to the fact that they eat very little processed foods. The bazaars in each city and town are the center of commercial activity, although there are some Rodeo Drive type streets in the bigger cities. The people in the bazaars are not aggressive in their approach to customers as they often are in other parts in the Middle East. The bazaar in Tehran covers five square miles and you can buy almost anything imaginable. The jewelry bazaars, the bazaars for carpets and other artifacts, like miniatures, porcelains, tiles and the like, make for interesting shopping, bargaining, and gift-buying. Then there is Isfahan. It is a city of about 1.5 million people. It is easily the most physically beautiful city that I have ever seen. There are miles of parks and tall plane trees which border all of the main streets. It is the City of Nightingales, Roses, Poets, and Lovers. There are indeed roses everywhere and many shopkeepers have a nightingale in a cage. The hotel where I stayed in Isfahan had large flower-filled courts, teahouses, and was appointed with hand made artifacts. The agricultural countryside in Iran is surprisingly lush. We were able to watch nomadic people driving their herds. These were pleasant surprises as were the snow-peaked mountains that were nearly everywhere. Looking back at how wrong my friends and I were about the people of Iran and its beauty makes one wonder what other realities may be so badly misunderstood. Attorney James M. Duenow can be reached at P.O. Box 12410, San Luis Obispo, CA 93406 or at (805) 541-6182.